Today, consumers expect to have information at their fingertips at lightning-fast speeds; now, a new standard for speed is about to be set. 4G will be taking a back seat in the coming years, as 5G comes closer and closer to becoming a reality. What could 5G do for the industry? Cutting-edge tech that hasn’t yet been developed to its full capacity for real estate, such as artificial intelligence and virtual reality, could become more heavily intertwined in agents’ and consumers’ day-to-day activities. The era of 4G brought with it several innovative technologies, such as streaming services like Netflix and Hulu and the beginnings of virtual reality combined with social media through applications like Snapchat and Instagram. The emergence of 5G will be a slow rollout, as users will have to upgrade to compatible mobile devices once the technology is available, which may take some time. Why? There are some hurdles. The most burdensome? According to the Wall Street Journal, Verizon will need approximately 10-100 times more antenna locations than currently available in order to support the short-radius travel restrictions of the high-frequency millimeter waves 5G requires. What would these added antennas attach to? Electric utility poles are an option; however, this could result in an exorbitant price tag, especially for a wide-scale rollout. New York City, for example, charges a minimum $4,200 annually to lease out cell pole attachments in Manhattan. The expansiveness of the project will also prove challenging. 5G would require the addition of hundreds to thousands of high-frequency millimeter wave antennas throughout a metro area in order to thoroughly service a densely populated area. At the beginning, 5G implementation could be rolled out at speeds slower than fully capable, beginning with a low- or mid-band spectrum infrastructure. This would still provide speeds that are 10-20 percent faster than today’s 4G. 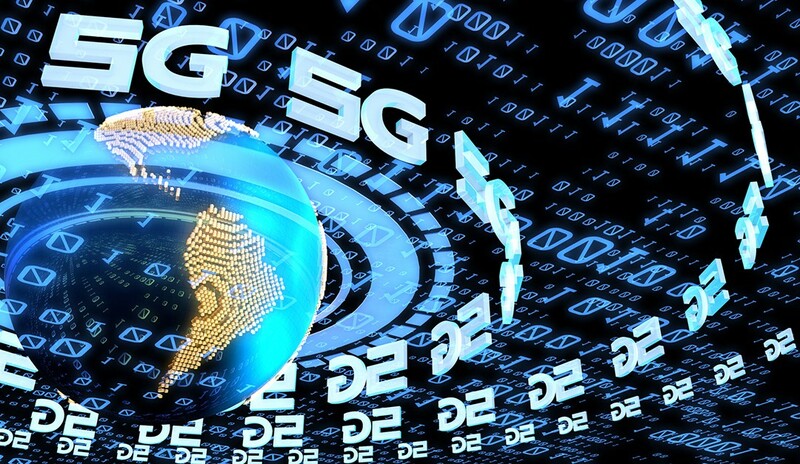 Several U.S. carriers are rolling out 5G (or aspects of it) in the coming months. 5G for the home is already available in select markets from Verizon Wireless. The company launched the service in Houston, Indianapolis, Los Angeles and Sacramento in early October, according to The Verge. AT&T says it’s not far behind, promising 5G home internet by the end of the year. Mobile devices with the capability to run on 5G have not yet been released. Sprint has partnered with LG Electronics to launch a 5G smartphone during the first half of 2019. Truly mobile-accessible, non-WiFi reliant 5G may not be available for some time—at least a couple of years, according to experts. Various startups are beginning the introductory work of building a foundation on which 5G can process data—miniature centers for specific towns and neighborhoods that would help get the upgraded network up and running. The addition of these antennas and data centers could also prove an obstacle in the real estate space. Large, unsightly poles could be an eyesore for residents, ultimately impacting resale value on homes located in the vicinity. There’s already been some pushback, both toward excess poles and the surrounding legislative support for wireless carriers over the consumer. The Federal Communications Commission is implementing regulations that restrict local governments’ control of these data centers. While primarily in testing, autonomous automobiles on a more sophisticated 5G system could increase data speeds, allowing smart cars to communicate with each other at breakneck speeds and reducing the chances of accidents and traffic or parking congestion caused by human error. These cars would likely be able to exchange information on their location, speed, acceleration, direction and steering, and could feature automatically reactive programming that is more reliable than what is currently being tested on 4G infrastructures. With self-driving cars, homebuyers could experience a concierge-style service that allows them to sit back and enjoy the home-showing process without having to worry about driving themselves around to find properties. Additionally, this would free up the agent, allowing them to provide essential property information on the way to these home showings without being distracted by driving. This is also a more opportune time to discuss sensitive information, such as motivation and whether the home fits the buyer’s needs. In August, AT&T announced a 5G pilot program for a community in Texas with the goal of ultimately forming a synchronized urban transportation system, featuring innovations such as flying taxi cabs supplied by Uber and self-driving cars from startup Drive.ai. While already available in some respects, virtual reality could really become elevated with 5G speed, making it a seamless and truly realistic experience. With augmented reality becoming more commonplace, the industry could begin seeing an abundance of virtual home tours and augmented reality centers where buyers can be shown multiple homes without having to physically step out of the brokerage’s office. In a benefit for out-of-towners who can’t simply hop on a plane to view potential homes, accessing virtual reality showings via their mobile apps could revolutionize the industry. Virtual reality company Magic Leap has already partnered with AT&T to provide a real-time, immersive augmented reality experience via their headset in preparation for a 5G launch, according to the Wall Street Journal. With 5G speeds, homeowners could elevate the value of their property by converting it into a smart home. 5G connectivity could bring deeper integration across smart home devices, utilizing less data and less energy without sacrificing speed. Additionally, 5G could lead to better insights on home energy consumption, leading to savings down the road. In terms of home security, 5G could provide improved technology such as better surveillance in remote areas, as well as increased battery life for electronics. For homes with disabled residents, surveillance integrated with medical company contacts could help save lives, providing immediate assistance in the case of home injury. 5G could bring about lifestyle changes that could drastically transform the way consumers search for a home. With 5G, virtual reality and smart home technology could become routine, allowing consumers to experience a sporting event or concert as if they were actually there, instead of sitting in their living room, or allowing individuals to “try out” vacation spots before booking a ticket. The more capabilities are introduced, the more dependent we may become on the technology. Will 5G lead to a whole new set of homebuyer must-haves?